Heritage Weekend takes place on Saturday and Sunday the 15th and 16th September. All tours depart from Emoyeni, 15 Jubilee Road, Parktown where there is safe parking available. Booking is now open at the office only on 011 482-3349 / mail@joburgheritage.co.za Book early to avoid disappointment. I received an advance copy of the printed book this week. It looks amazing! Great job also to Yeshiel Panchia who took the ‘Now’ photos. It will be available soon and I will make a proper announcement once I have the firm dates from the publisher as to when it will be on the shelves and on-line. There will also be a formal launch, which I will announce at the same time. In preparation for the book launch, I’ve been updating and adding to my old posts. One criticism I’ve received is that my reference and bibliography are not up to scratch. I’ve been fixing this as well as adding sources to all the photos. Some of the early posts have been given an extensive re-write as I’ve gone back and added some considerable back story (and fixed some factual errors). The very first post is a good example of this. Click HERE for the new and updated version of ‘Introduction and Randjeslaagte’. The rest of the posts will be updated over the next few weeks in a similar way. There is also an INDEX in draft form that will breakdown all the posts into various subjects with links for easy selection scheduled for November 2018. As a result of all of this (and the book that took 18 months out of my life), I’ve still not published any new work. Do not fear, as there is a fascinating piece on the arcades of Johannesburg which follows on from the piece in the book (it was shortened due to space constraints) coming in October 2018, a piece on Masonic Lodges for November 2018 and the next suburb ‘Fordsburg’ scheduled for December 2018. There is also a new Johannesburg1912 Facebook page HERE linked to Instagram HERE and this site. This is really just to take advantage of the promotional activities that can’t be accessed via a normal account. Subscribing to this site and Instagram will ensure you miss nothing! 08 Sep	This entry was published on September 8, 2018 at 8:30 pm. 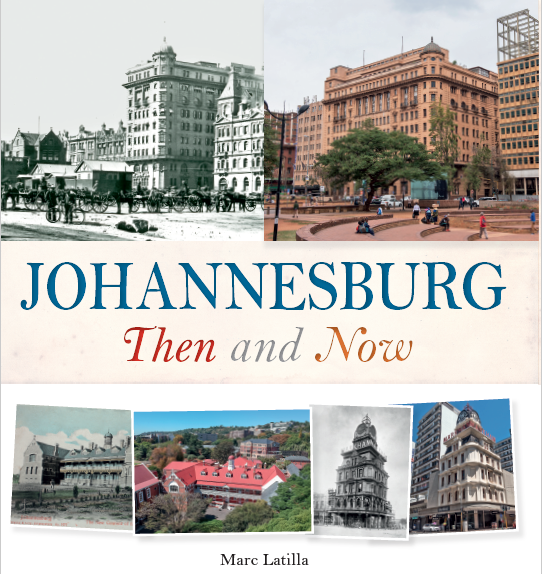 It’s filed under Johannesburg and tagged Heritage Tours, Johannesburg Heritage Foundation, Johannesburg Then and Now. Bookmark the permalink. Follow any comments here with the RSS feed for this post. Well done Marc. I have loved your posts and if the book ever comes to the UK then I am sure I shall love that to. Thanks Rosemary! I will provide info on where in the world the book goes. The plan is to send some to the UK and Australia. Failing that, it will also be available as an eBook. Again, I’ll provide links closer to the time. You are to be congratulated on this unique initiative! An 18-month investment! Wonderful! And I look forward to reading your new posts too. Thanks Roelien! The material Beverly sent looked amazing.